"Imagine having an opulent compilation of history's most elegant and beautiful patterns and designs at your fingertips - to use, peruse, admire, and be inspired by. 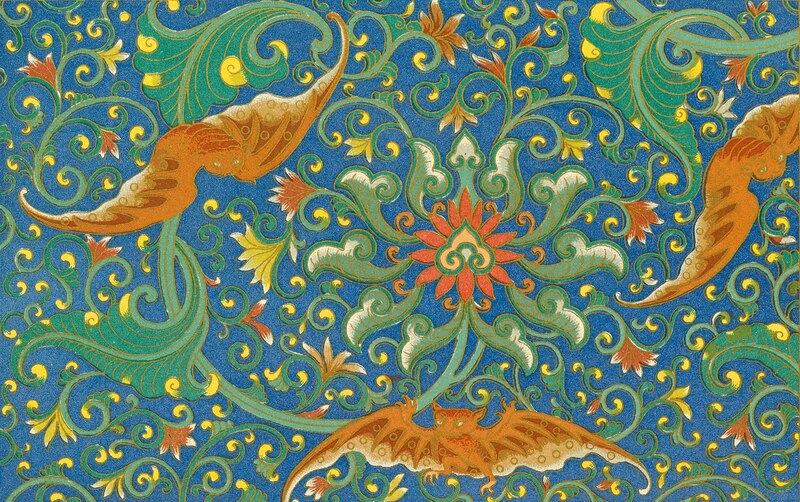 World of Ornament brings together the two greatest encyclopedic collections of ornament from the 19th century chromo-lithographic tradition: Auguste Racinet's L'Ornement polychrome Volumes I and II (1875/1888) and M. Dupont-Auberville's L'Ornement des tissus (1877). Adapted from historical items dating back to antiquity, such as jewelry, tiles, stained glass, illuminated manuscripts, textiles, and ceramics, these ornamental designs encompass a wide range of cultural aesthetics including classic Egyptian, Greek, Roman, and Etruscan motifs, Asian and middle-Eastern patterns, as well as European designs from medieval times through the 19th century." Okay, now imagine having that entire collection available online, completely free. Don't believe me? Check out this link. Use the top menu bar on the webpage to search through the different chapters. Pick one you like, then scroll over the large thumbnail on the left to see which filename to download. Right-click and save! What an incredible resource the internet is!